#EcoMonday tip 9: Eat Insects! Let's start our week off fresh, with a culinary #EcoMonday tip! I mentioned the 'problem' of meat consumption before. Around 70% of farmland is used for meat production at the moment and livestock is the largest source of greenhouse gas emissions. 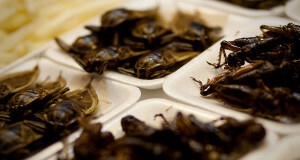 Dropping meat from your diet is one way to go, but another one would be to start EATING INSECTS. Why? Because insects match up to chicken or beef (nutritionally, not talking about taste & flavor here ;)), and they have a much lower impact on the environment. They are high in protein, have important vitamins and essential fatty acids. When I was travelling through South East Asia, it was far from weird to see old ladies munching on bugs. It's not gross, it's a cultural thing :). Break those barriers and start eating insects! To get you started, here's a nice recipe involving crickets and chocolate (now don't tell me that does not make your mouth water!). Preheat oven to 190°C. In small bowl, combine flour, baking soda and salt; set aside. In large bowl, combine butter, sugar, brown sugar and vanilla; beat until creamy. Beat in eggs. Gradually add flour mixture and insects, mix well. Stir in chocolate chips. Drop by rounded measuring teaspoonfuls onto ungreased cookie sheet. Bake for 8-10 minutes. Found at Iowa State University's Tasty Insect Recipes, check it out for some more inspiring recipes!